Venice, the city of canals is unlike any other in the world. The city consists of 117 islands, over 400 bridges crossing the 150 or more canals. Once a formidable maritime power in the 13th and 14th centuries under the leadership of the Doges, Venice was founded by people fleeing the barbarian invasions from the inland Roman towns. Venice is now one of the most popular cities on the European tourism circuit and all should plan a visit to Venice and it's quiet, car-free, waterfront serenity. 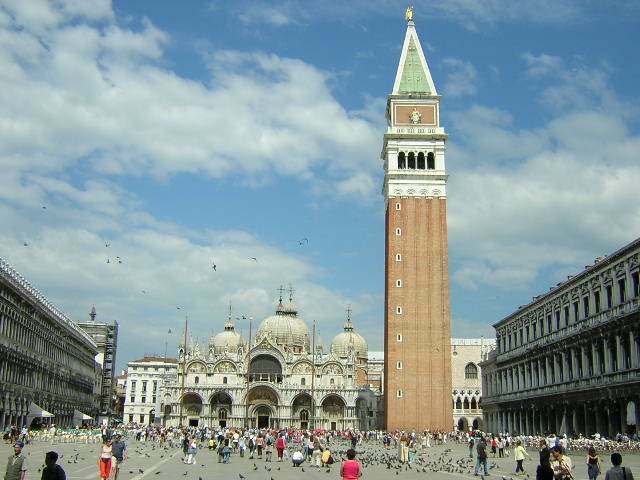 The Piazza San Marco is one of Venice's best known places and a definite sight to see for every visitor. The Piazza is along the Grand Canale, hosts the magnificent Basilica di San Marco and is a major meeting point for revellers, locals, tourists and pigeons alike. During the Carnevale, the Piazza is a major hub of activity and entertainment with revellers dancing and partying away in their masked outfits. The Basilica di San Marco, with it's 99 metre bell tower, houses the tomb of Saint Mark within the walls of this Byzantine symbol of Venetian wealth and power. The design of the exterior of the church was influenced by the churchs of Constantinople, now Istanbul, with the most noticeable feature being the 5 domes of the Basilica. Admission to the Basilica can be quite a test of patience, especially in high season when queues are long. It is however well worth the wait with the interior of the Basilica being absolutely magnificent. Marble flooring under foot will lead you through to the sarcophagus of Saint Mark, taken from Alexandria, Egypt in 828 and laid to rest here in Venice. One of the more notable features of the Chiesa d'Oro, or Golden Church, as it is also known, are its' walls and ceilings covered in mosaics added over several centuries. The upper section or Galleria is also worthy of a look, especially for access to the balcony providing great views over the square below and the rest of the city. The Palazzo Ducale is right next to Saint Mark's Basilica. The palace was the seat of power for the Venetian Doges. Tours of the impressive palace are available, both guided and audio. The Bridge of Sighs, named after what people believed would be the last outside world thought and action of those crossing the bridge before entering their place of encarceration. The Grand Canal or Canal Grande is Venice's main thoroughfare. Stroll along it, take a gondola, water taxi or vaporetto No.1 and take in the beautiful waterfront palaces and mansions. The Canal can be crossed with one of three bridges, the Rialto, the Ponte dell'Academia and the Ponte dei Scalzi. The renowned Rialto Bridge was built in the 16th century and named after Antonia da Ponte and is one of Venice's most popular "attractions" providing 1 of 3 useful crossing points over the Grand Canal. Yet another dominating church in Venice, the Basilica de Santa Maria della Salute is an impressive structure situated at the entrance to the Grand Canale. It was built in the 17th Century to pay homage to Virgin Mary of Good Health as she had just saved the city from the ravages of the plague. The Gallerie dell'Accademia is filled with the works of masters, among others Titian, Bellini, Carpaccio, Canaletto and Veronese. It represents a collection of Venetian artwork from the 13th to 18th century. The queues to enter are long and tedious but for art lovers, the Accademia is a must. The Peggy Guggenheim Collection is considered to be one of the world's better and important collections of modern art accummulated by Peggy Guggenheim. It is actually an unfinished palace called the Palazzo Venier dei Leoni which the American called home for 30 years. The list of artists reads like a who's who of modern art with Picasso, Dali, Pollock, Magritte, Kadinsky, Bacon, Mondrian and Chagall all represented. Queues also get ridiculous here as the museum is quite an attraction for art lovers. Although not a pleasant thought in history, the Ghetto Nuevo was a place where the Christian powers that were, segregated Venice's Jewish population from as early as the 16th century. Notice the architecture and visit the Museo Ebraico to fully understand the plight of the city's ghetto residents. Venice is almost immediately associated with romantic gondola rides along the Grand Canale. The prices are a bit steep but a gondola ride is really a must for those seeking a bit of romance, a great view of Venice and that unforgettable Venetian experience. Not too far away from Venice is Verona, take in an opera and some culture at the Piazza Bra. The beaches close to the city are on the Adriatic in the Lido. They are decent enough for a swim and a bit of a tan but there are many nicer beaches in Italy. Economic activity, shipping and pollution have not been that kind to the Lido. Venice is close to the Adriatic and the fish of the day will always be fresh and tasty. Pasta is afterall an Italian specialty and the many different dishes using pasta as a base are delicious in Venice. The regions most known contributions include a white wine called Suevo, red Bardolino and the popular bubbly Prosecco. A popular dessert, served around the world made of mascarpone cheese, chocolate and Marsala sponge. You can find excellent hotels in Venice overlooking the many canals. Many of the main hotel sites will have diverse hotel listings and availability. Find Venice Hotels. There are loads of hostels and cheap accommodation options in Venice. Prices vary from hostel to hostel but are generally affordable. Search and book a hostel in Venice. Venice Treviso airport is also nearby but requires some travel to and from the city to get to. Find out more about the airport at www.trevisoairport.it. Walking is the best way to take the greatness and sights of Venice. Little gems lie waiting in the little side nooks and crannies, away from the main tourist hubs and thoroughfares. The most romantic form of transportation in the world. Add a musician to the ride and sweep someone off their feet. The prices are a bit hefty, but really, would Venice be Venice without a gondola ride? The vaporetti, plural for vaporetto, are water buses. The vaporetti service the major canals of Venice are an economical way to get around the city itself. Take the No.1 vaporetto to see the whole of the Grand Canale. Vaporetti can get quite crowded and it is a good idea to keep an eye on your belongings while enjoying the ride as pickpockets don't discriminate against easy targets. Slightly more exciting, and more expensive than the Vaporetti, water taxis will take you wherever you may want to go and are fine if you have the spare cash to blow. The main train station is called Stazione Santa Lucia. Trains to other major cities in Italy and parts of Europe are available. A car is only useful to visit the mainland of il Veneto, you won't need one in Venice, there are no roads! Italian but with so many visitors all year, almost any language can be heard while visiting this amazing city.